From left, David Lehman, Gov. Ned Lamont, Indra Nooyi and Jim Smith. Gov. Ned Lamont, who promised to recast the state’s troubled relationship with business, invoked a halcyon time of corporate engagement in Hartford on Friday as he outlined a new approach to economic development to be led by David Lehman, a 41-year-old Goldman Sachs partner, and backed by the retired chief executives of PepsiCo and Webster Bank. 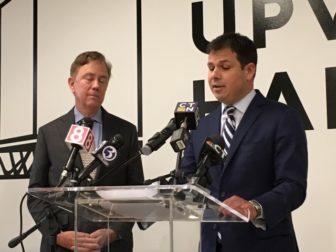 The governor showed off Lehman as the latest mid-career executive to join the new administration, someone Lamont hopes will be a savvy leader as well as a symbol of business leaders’ willingness to help Connecticut end a decade of economic stagnation and bad press. After watching the governor’s inaugural on Jan. 9, Lehman made a cold call to Lamont’s transition team, seeing if he could help in some way. The call led to a breakfast with the governor’s chief of staff, Ryan Drajewicz, and Garrett Moran, the former chief operating officer of the Blackstone Group, who has helped to lead the transition. Lehman will serve as commissioner of the Department of Economic and Community Development and senior economic advisor to Lamont. Two former corporate CEOs and chairs, Indra Nooyi of PepsiCo and Jim Smith of Webster Bank, will lead the non-profit Connecticut Economic Resource Center in a new public-private partnership with DECD. As is the case with the governor, Lehman will be working without a state salary, Drajewicz said. Lamont, 65, a Greenwich businessman who has little familiarity with Hartford political and business history, fondly mentioned stories he’s recently heard about “The Bishops” of Hartford — the business leaders who lived in a time before mergers and consolidations robbed small cities like Hartford of deeply rooted corporations. Drajewicz came to Lamont’s staff from Bridgewater Associates, the world’s largest hedge fund. His commissioner-designate of administrative services is Josh Geballe, a former senior IBM executive and tech entrepreneur. 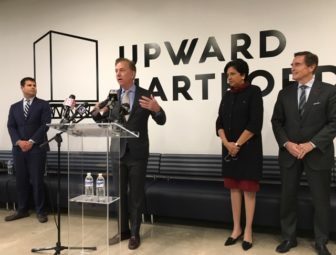 Lamont introduced the new economic team during a press conference at Upward Hartford, a self-described home to “some of the world’s most ambitious change-makers and entrepreneurs who come to connect, collaborate and create with fellow innovators.” It is based in downtown Hartford at the Stilts Building. The building also is home to the intellectual property law firm of Cantor Colburn, which became the unofficial headquarters of the successful recruitment to Hartford of Infosys, a global tech firm that recently opened a regional technology hub here. David Lehman and Gov. Ned Lamont. Lamont says Infosys can become a template for how to recruit new business: Nooyi introduced a senior Infosys executive to Lamont, who brought him to the DECD. Executives from the region’s top employers then convinced Infosys that Hartford had the workforce and base of insurance, health and advanced manufacturing company to support a technology innovation hub. Nooyi, who graduated with Lamont from the Yale School of Management in 1980, described her first ride into Connecticut in the late 1970s, when companies were fleeing New York City for the suburbs of Westchester and Fairfield counties. A native of India, she flew to JFK and took Connecticut Limousine to New Haven. Nooyi moved 28 years ago to Greenwich, where Lamont has a home and Lehman lives with his wife, Laura, and two school-age children. Lehman said he reached out to the transition after hearing Lamont’s inaugural speech about remaking government. The speech and the governor both struck him as accessible and pragmatic. “It just really spoke to me in a way that politics, candidly, has not previously,” he said. Lehman said he has seen other Goldman Sachs partners leave Wall Street for government service, though none in Connecticut. Lamont said he hopes the willingness to serve the state will be infectious. On Friday, Lamont was happy to bask in congratulations about his new appointments.